The Transportation Safety Board of Canada (TSB) found that ineffective crew resource management and an unstable approach led to the August 2015 hard landing of a Beechcraft King Air A100 in Margaree, Nova Scotia. 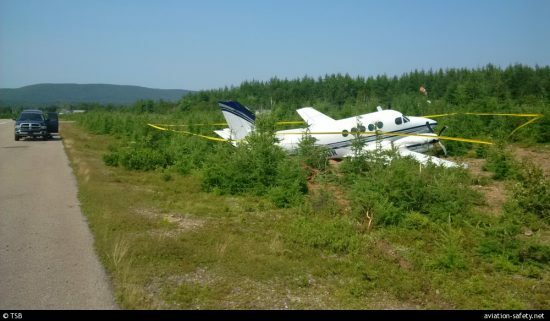 On 16 August 2015, a Beechcraft King Air A100 operated by Maritime Air Charter was on a flight from Halifax Stanfield International Airport to Margaree Aerodrome, Nova Scotia, Canada, with two pilots and two passengers on board. While conducting a visual approach to runway 01, the aircraft touched down hard approximately 260 feet beyond the runway threshold. Almost immediately, the right main landing gear collapsed, causing the right propeller and wing to contact the runway. The aircraft then slid along the runway for about 1350 feet before veering off the runway to the right. There were no injuries, though the aircraft was substantially damaged. The investigation found that the crew did not anticipate that landing on a short runway at an unfamiliar aerodrome with high terrain nearby would increase their workload during the approach and landing phase. This increased workload led to the crew’s reduced situational awareness. As a result, the crew did not recognize the aircraft’s steep rate of descent as being indicative of an unstable approach condition. The aircraft crossed the runway threshold with insufficient energy to reduce the rate of descent immediately before touchdown, resulting in the hard landing. The findings of this investigation are consistent with a lack of effective crew resource management (CRM). If CRM is not used and continuously fostered, there is a risk that pilots will be unprepared to avoid or mitigate errors encountered during flight. Although not required, Maritime Air Charter had voluntarily implemented a safety management system (SMS). However, the SMS elements were primarily used as a reactive method to address potential safety concerns. Following the occurrence, Maritime Air Charter Limited introduced revised procedures to improve the safety of its operations. These include a preflight risk assessment checklist, a requirement to calculate accelerate-stop distance when taking off from shorter runways, and enhanced training, including increased emphasis on stabilized approach criteria and controlled flight into terrain avoidance.